Up to 28 can play! Room for 24 inside with our stadium seating! We are fully self-powered. The outer "Action Station" can accommodate large groups. The inner "Action Station" is great for up to four dancers. 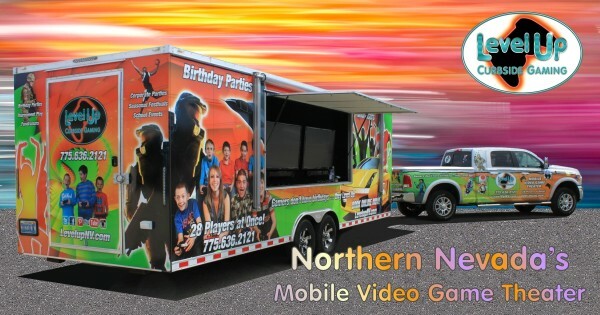 Luxury 32ft Trailer with 7 HD TV's, Surround Sound, Stadium Seating and Climate Control with a Party Atmosphere inside! Smiles and Laughter are CONTAGIOUS when you game with your friends! Level Up Curbside Gaming - Video Game Parties! 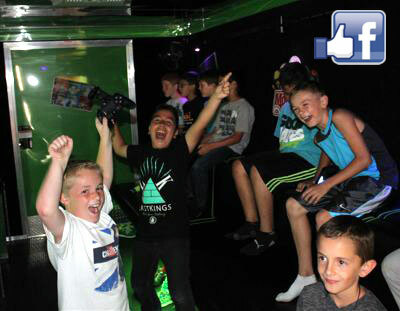 We bring the ultimate video game party right to your front door! Our luxury, limo-style theater on wheels features 7 HD TV's! 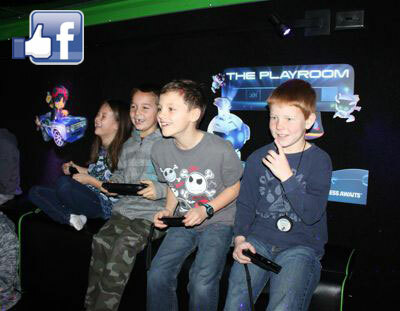 Surround sound, Stadium Seating and our amazing "Action Stations" enhance the fun. Need a Birthday Party Idea? See our Pinterst link below. This is multi-player social gaming heaven! Up to 28 players! We have all the latest games, DLC and consoles. 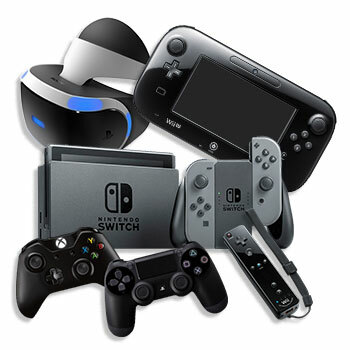 Nintendo Switch, 5-Xbox 360, 2-Wii, 4-Wii U, 3-Xbox One's, 2-PS4 & PlayStation VR. Planning a Summer or Winter Party? We are climate controlled! Our Game Coaches will make sure the kids have a blast and the parents get a break! 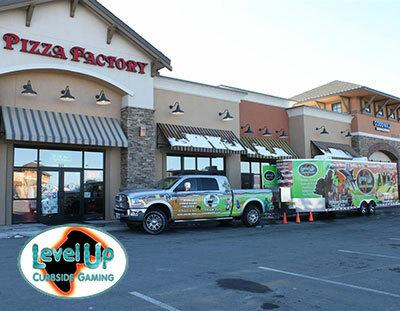 Book your party today and see why Level Up Curbside Gaming is the best birthday party idea in the Reno / Sparks / Carson City and Northern Nevada area! Take your Celebrations to a new Level! It is a long ride! Give us some space and we'll give you a party! Don't have the room? We suggest a city park, pizza parlor or church lot as an alternative. Click here for our "Parking Page"
They don't just have fun. They have a blast! See more party pictures on our FACEBOOK page! Please LIKE us while you are there. Have an event that needs some unique entertainment? Book us for that ultimate party! Summer BBQ, Tailgate, Superbowl Party, Family Reunion, Bar Mitzvah Party, Halloween, New Years or 4th of July Block Party! Are you planning a video game party with a theme? Minecraft, Super Mario, Lego, Disney or Game Console. We have many ideas and inspirations on our Pinterest page. We encourage FUN! .......Yelling and screaming optional. Gamers don't have birthdays...they LEVEL UP!! See more on FACEBOOK. Need a Fundraiser Idea for a school, church, sports or youth group? Contact us for information and special pricing. "Safe & Sober Grad Night" coming up? We work late and entertain in the wee hours. Are you planning a video game themed birthday party? We have multiple copies of Minecraft, Super Mario, LEGO Games, Halo 4, Call of Duty, Black Ops, Just Dance and more. Up to 24 players for Minecraft! Up to 16 can play a Halo 4 competition on the same game and map! Need a birthday party idea for your theme? Visit our Pinterest page for inspiration. We are the entertainment solution to your next event. Whether it's a birthday party, fundraiser, anniversary party or play date with your best friends. Need to entertain during a reunion or Super Bowl party? We'll do all of the work! No cleaning up before guests arrive or after they leave. Looking for a party the kids will talk about for years? Pizza Parties and Bowling Parties are a thing of the past. With Level Up video game parties, everything else pales in comparison. Be the first to have us roll into your neighborhood! If you're looking for party ideas for a teen party, a kid's birthday party, graduation party, bachelor party, adult get-together or church or school event, book with us! We provide entertainment!